Back in the 2016 version of this study, IPVM was skeptical that Hanwha could overcome losing the Samsung name and the Chinese race to the bottom. However, 2019 results show integrators' support of Hanwha growing strongly. In this report, we look at how perceptions have changed since 2016. 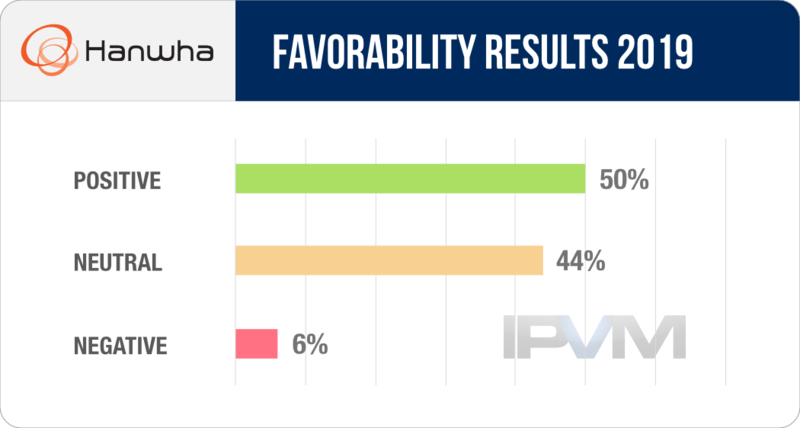 There were a few notable shifts that led to Hanwha's overwhelmingly positive net favorability of +44. **** ** ******* ******* ** **** *****, **** *** ********* **** ****** ***** ******** ****** *** Samsung **** *** *** ******* **** ** *** ******. *******, 2019 ******* **** ***********' ******* ** ****** ******* ********. ** **** ******, ** **** ** *** *********** **** ******* since ****. ***** **** * *** ******* ****** **** *** to ******'* ************** ******** *** ************ ** +**. "***** * ***'* **** ***** ******* **** *** **** ********* as *** ** ****, * ** **** ****. * ***** they *** ******** ****** **** ** ****. *** * ***'* think **** **** *** ******* ** ******** **** ** *****. They *** * ***** ****** ** * **** *****. * wish **** ***** ** **** **** *** ***-***** ******** *** move ** * ***** ** ***** ***** *******." "**** **** ******* ***: ***, ****** & **** **********/********. *********** pricing. ***** ***** ********* ** ******* ** *******. **** ***** multi-sensor ********. ******* *** ***** **** ***********. **** *******." "******* *** ********* **** ** *******. ***** *** ********** *********** pipeline ** ********* *** ********** ******** **** *** **** *** years. ******* ** ***** ****** **** *** **** ***** *** flexibility ** ************ ********* **** **********." "****** ** *** **-** ******. ***** **** ********* ******** ***** well *** ***** * ****** ******* **** ***** **-***** *********. They **** ******* ** *** ***** ****** ***** ***** ******* them **** ****. ****, ***** **** ******* ** **** ******." "**** ****** ***** ******* **** *******/****** *******. **** ***********, ***********, and ******** *** * ****** *********** *****." "** *** ***** * *** ** ***** ********. ***** ** cameras, *** *** ****** ***** ******* **** ***** **** **** few *******. ***** ******* ** ****. ******** ******* *** **** very ****." "****** ***** ****** **** ****** ****, ********* **** *** * tiers ** *******, ***, ****** *** ****. ******** *** ************ competitive, *** ******** ** ************ ***** ****, ******** ** ****-********." "*** ****** ******* *** *****! (******** *******). **'** ******** **** 100's ** **** *** *** *** ******* * *** ******. Seem ** **** **** **** **** ***'* ***." "**** **** ******* ****. **** **************. **** *******. **** ************ project." "***** *****, ****** *********** (******** ***** ** ******** ** ****, our **** **-** ************). **** ******* ** ***** **** *** need ****." "***** ******* ****, ****** ****** ** **** *** ******. **** reliable *** ****** ** *****. ********* *******, *******." "******* *** *********, ********** *** *** ****. * ***** *********** to ****. ** **** **** ****** ** * ****** ** projects **** ***** ******* *** ** *** ******* ** *** video." "* **** **** ****** ******** ******* ******* *** ******* **** to **** *** ******** ** * ***** ***** *****. **** fact ***** ****** ** ** ******* * ******** ******** ** clients ****** ******." "**** *** *** ** *** *** ******** *** *****. *** Q ****** *** ****** **** *** ** ** ****** ************. The * *** * ****** *** **** ******* *** ********** for *** **** **** ** ****. ***** ***** ** ****** always ****** **** ****." "** **** ******* ********* **** *********** **** ****** *** **'* not *** **-** ****** ************. ** ****** **** **** *** 8080 *** **** **** **** ********* ******* ********, **** ******* of ******** ************ **** ** ******* *******, ** ********, ******* out ** ******** *****. ***** ******* ** ********* *** ******* are ***." "** ** *******, ******** *** **** ********** ** *** *** camera ************ ******* ***** ** *** **** ** *** ** features. ***** ******* ******** ******** ** **** *** ****. *** to **** **** ***** ****** **** **** **** ***** * bit (**** *** ***, ** **** *****, **** ********** **** Axis.)" "**** *********, ******* * *** *********** **** ****. *-**** ******** excellent, **** **** ******** *******." "** **** **** ** *** **** **** *** *** **** when ** ***. ** **** ********** ***** ************ **** **** go ***** *** ****** **** *** ********* ** ******* **** we *** ****." "****** ** *** **** *****-**** ***** ****. ********* *******. **** compatibility **** ******* ***. **** ***** ***. **** ***'* ** to **** *** ********!" "**** *** **** ****. ******* ** ********* *** ******* ******* are ****** ****** *** ***** **** *** **** ** ** a **** ****** *** ****** **** ** *** ******." "***** **** *** **** **** *** ********, ** ***** **** are ****** ** **** **** *** ***** ***** ** *** video ******* **** **** ** *** *** ***** *** ******* NVR ***** ******** *** ******. ******* ** *** ***** ** start *** ****** * ******** ******* ******* *** **** ******* line ** *** *** *** ******** **** *** *** **** support ** **** ** ******. ******* *** *********, ** **** to **** *** **** **** *****." "***** ** **** * **** ***. **** ** ****** **** out." "* ****** * *** **** *******/****** ******. * ******** ** Hikvision ** **** **** *** **** ** **** ****** ******* for ****. * ******** *** * ****** ** ********* *** Hanwha ****** *** * *** ********* ** *** **** *** outdated *** ***-********* **. * **** *** **** ******** ****** it's **** * **** ********* ******* ******** *** **** ***'* even ***** *** ***** **** * *** **** ******* ********. Also, ****** ********* ***** ** ******." "** *** ****, *** ***** ****** *** ***** ******* ** work **** ******** *** *** ** **** *** **** *******. One ******* ** *** ******* ***** ** ******* ** * site ** ***** ******* ****** *** *** ************* ******* ** when ** *** ********* **** *** ***'* ********* ****** *** view. ** *** **** ** **** **** **** *** **** to ******* ***** ***** *****." "*** *** *****, **** **** * **** ******. * ** think *** ******* ***** ***** *** ***'* **** *** *** antique ***** **** ***." "***** *****, ****** *** ******** ** ****** ********* ***. **** are ******** ****** *** **** **** ******** *** ********* *** license *** *** **** *** **** *******." "* ***'* **** *** **** ** *** ******* ** **** as ******. ***** ************* ****** ***** *****. ****** ******** ***** support ******." "**** *** ***** **** ****/*********** **** *******. ** ********** ******** to ***** ***** ****." "***** ******* *** ******* **** ****, ******* ******* ********* *** brand. **** ******* *** *** *****." "* **** *** ******** *** **** **** ** **** ****. Just **** **** ***** **** **** *** ******* ********. **** easier ** ****." "****** ******* - **** *****. * ******* **** ****** **** the **** ** ******* *** ******** ** **** *** **** of ****** *** **** * *********** ********** *******. * ***** like ** *** * ******** ********** ***** ******** **** ****** and * ****** **** *********." "****** ******** *** *** ***** ***** ** ***." "* **** *********** ** *** ***/***** *******. *** *** **** images *** **** ******. ********** *****/*********** *****. **** **** ****** from *** *** **** ***** ******** **** ***** ** ** a ********* ** **** *******/********* ************ ***** ***** ** * pain ** **** ** **** ******, ******** *** *** *******. Overall ****** **** **** ** ** ** *** ******* *****." "******* ********. ** *** ******* ** *********** **** **** ** a ********* ***********." "** *** ***** **** ***** **** *** **** ** ********* has ***** ******. **** ***** *****, ******* *** **** **** so ***." "*** ******* ** ** *********** *** ********* *** *****. ***** high-end ******* **** **** **** **** *** **. ****** **** their ********* *** ******* *** *** ***** ***** ** ** very **** ** ****." "******* ** **** ** * *********** *** *********." *** ***** ** ******* ******** *** ******, **** **** ****** it ** ****-********** *******, *******, *** ***** **** ** ******* not **** **** ******** ******* ****** **** ********* *** *****, but **** ************* ******-******, ******* ************* **** **** *** ********. ***-***** ********* *** **** **** -- ** **** ** **** the ****** *******-**** ** ****** *. *** *'** **** ******* short ** ***'*. ** *** * ***** ***** *** ****** dropped ********** ** ******* ** ****. ***** ******* *** ** absolute ** **. *** *** *** **** ****? *** *** *** ****** **** everything ** **** *** *** *** *********? ** *** * ******* **** ** ******* ** *****. ****** majority ***** ** ********* *** ** *** *******, * ******* my ************ ***** * **** ** * **** ** ****** brands ** ********. *** ********* *** ******* *** *** ** flag ** ** ******, **** ***** * **** *** ** their ****** ********* *** ** **** **** ****** ****. *'* ** ***-**** *** *** **** ****** ******** **** ****** on **** ******* ******. **** **** **** ********** *** ****. The ** *** ******** ***** *** *** *** **** **** been ********* ********** *** *********** **** **. *****. **** *** ****** *** ** *****, ***** *** ********* ******* going ** * ** ********* **** *** ***** ** ** this. **** ** *** ****? **** **** *** * ******* ********** facility ******* ****** * ***** ** *******, ****** ********** *****. *** *** ********* ** **** *** *** ********? * ** worried **** *** *** ****** ** ********* *****. ****** ******* immediately. **** *** ******* ** ****** * *********** ****** ** ***** to ***** ***. * **** *** **** **** **** *** will ****** ** **** ** *** ****. * *** ********* provide *** **** ***** ** ** ***** ** *** ****. *'** ***** ** *** *** *** ******* *** *********. ******. *** ******* ** **** *********? ***** ******* **** ***** **** manufacturering *****. #*'* ***** ** ************ *** ***-*** *********, *** *******. ****** has ****** *** ***-*** ******** ***** *** * ** **** going **** *** ***** *** **** **** ** ********** *** claims. ** **** ** ********* **** ******* ****** *** #**. *** ******* *** ***** *** *** *** *** / ******** business, *** ************ / ******** ******. #**'* *********** "**** *** ****** *** ** *****" ** ********* ***** **** is **** ***, * ******** **** **** ************ **** ******** from *****. *******, *********** ** *** *** ********* ***** ******** on *** ******** ****. * ********* *** ******* *** *********. **** ********* *** *** my ******. *’* ***** ********, *** *** *** ******* ***? ******** *** **** ***** *** * ***** ** **** ***** could **** **** *** ******* ** *** ****** ***** ****. ****** *** ******* *** **** ** *****. *** **** ** been ********** ***** **** ******* ** ********. *** ** *** ******* * ****** **** ******** ******** ** allow *** ******-**** **********. **** ******* *** ******, *** *** now ****** *** ***** **** *****, ** **** ** *** full ***** ****. ** ****** **** ** **** *** ** install *** ****** *** **** **** ********. ***** ******, *** * ****** (*** *****-*** ***) *** ***** htm5-enabled, *** *** ***-**** ************ ****'* **** *******.. ****. *** ones * **** **** ****, ** **'* *** * *** deal, *** ***** **** **'* ***** ** ** *. ** ***** even *** ***** **** ** ** ******* *. *** ******* **** ** **** ** ***** ********* *******? **** *** ** ***** ****. * *** ********* ** *** ***** *****. * ********** *** meaning. ***** ***.